First of all I have to say THEY WORK !!!!!! I just went out and made the connections, turned the key on and tried the wipers, all functions work as they should. The parts I used were from a 96 Hardbody, no idea if other years are the same so all info below will be based off of the 96's wiring and my 93's wiring. I also grabbed the plugs for the variable wiper switch and the wiper amplifier with a few inches of wire. 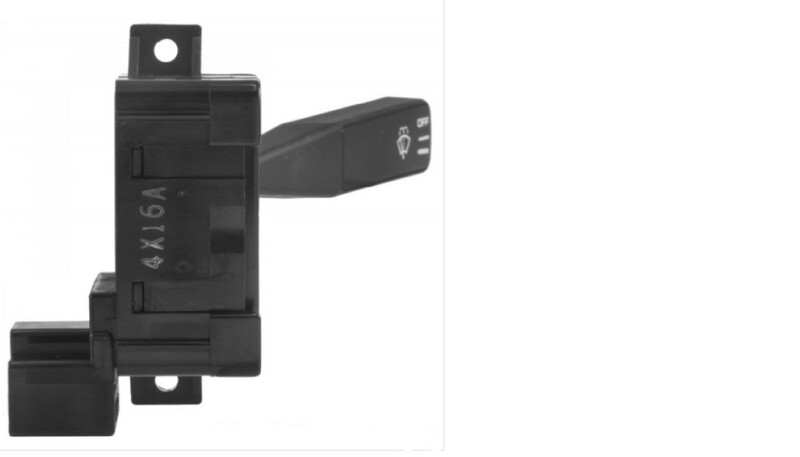 One thing I noticed, on my 93 the plug for the wiper switch is on the bottom of the non variable wiper switch and the plug on the 96 variable switch is on the top, it looks like it will just barely clear the ignition but I haven't gotten that far to say for sure yet. Also the 96 switch has a plastic ridge on the top and bottom of the switch that prevents it from sliding down into where the switch has to sit, I grinded the ridges off with my Dremel tool and the 96 switch slid right in where it is supposed. 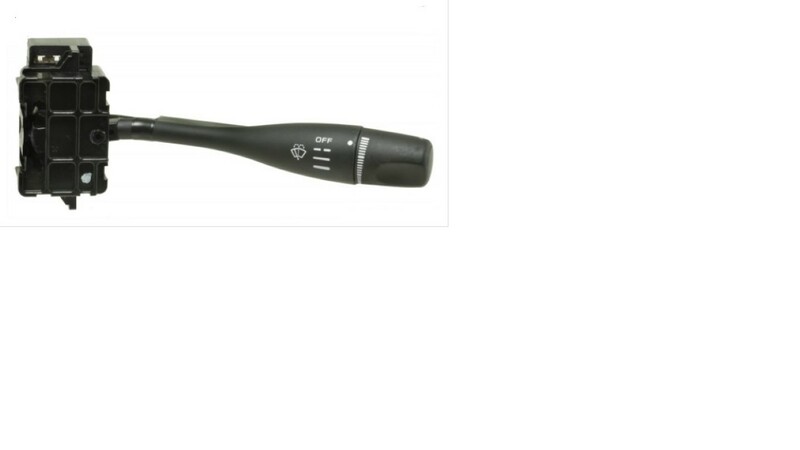 7 - Blue/Black - connects to Blue/black on the variable wiper switch plug and also to the Blue/black from the stock wiper plug. 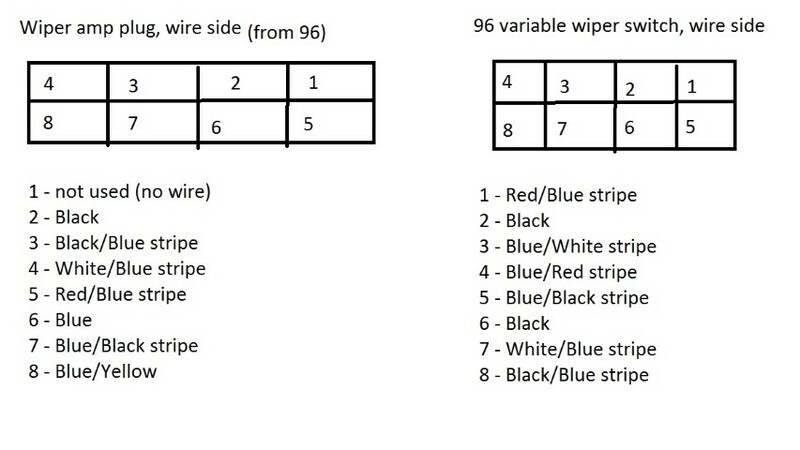 After all connections are made, turn the key on and test out wiper functions, if all connections were made as stated above wipers should work. 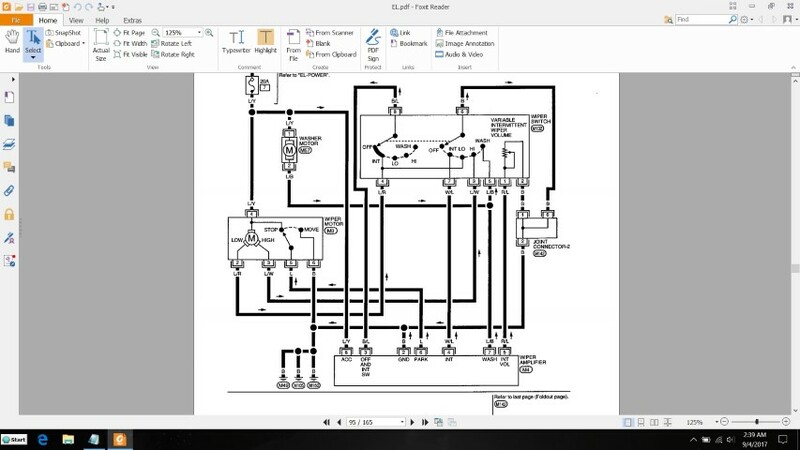 I still have to permanently connect all the wires and may have to extend them depending on where I mount the wiper amplifier, I'm going to see if I can mount it right inside the column covers, if not I will mount it under the dash near the column. I know how that is ! Been wanting to do this swap for a while but the info online was hard to follow so I had to figure it out on my own. Just edited the above post as I left two wires out, I added them and all should be correct as to the way I did it. When I cut the plugs off the donor 96 Hardbody I got about 6 inches of wire for the wiper switch and wiper amplifier plug. This length was long enough to just make all my connections and after taping up all the wires to place the wiper amplifier under the dash out of the way. I used a tie wrap and secured it to the bottom of the steering column, used a few more tie wraps and secured the wires out of the way, and ran the power wire to the fuse box inside the dash (had it connected from the front of the fuse block just to test the switch). In the future I may connect the power wire to the backside of the fuse box, but for now it's fine how it is. Also cleaned the switch, I may buy another switch or a new one as this one the markings are not visible, it's not a big deal as how complicated is a wiper switch to operate anyway LOL. Reinstalled the column covers and it looks just like OEM. As far as the switch clearing with the plug on the top, only thing I noticed is to remove the plug, you need to remove the switch first, as the plug will hit the lock cylinder and there is not enough room to remove the plug. variable wiper switch from a 94-95 will screw in without any mods. I have a wrecked 94 I am parting out and I just completed the dash swap into my 93 truck, minus putting the rest of the dash on because I still need to get the power mirrors working and I would like to get the variable wipers working too. Do you happen to have a picture of what the wiper amplifier looks like? So I replied to another thread here - I pulled the amplifier from a 1990, plugged in, and then ordered a new stalk from a Nissan dealer in GA - plugged it in, bada BING. Good thing too, it rains like crazy in Seattle, mostly drizzle, so I got to test them today- wish I had done this 10 years ago! !